The Dude is mostly inspired by Jeff Dowd, a man the Coen brothers met while they were trying to find distribution for their first feature, Blood Simple. Dowd had been a member of the Seattle Seven, liked to drink White Russians, and was known as "The Dude". The Dude was also partly based on a friend of the Coen brothers, Peter Exline (now a member of the faculty at USC's School of Cinematic Arts), a Vietnam War veteran who reportedly lived in a dump of an apartment and was proud of a little rug that "tied the room together". Exline knew Barry Sonnenfeld from New York University and Sonnenfeld introduced Exline to the Coen brothers while they were trying to raise money for Blood Simple. Exline became friends with the Coens and, in 1989, told them all kinds of stories from his own life, including ones about his actor-writer friend Lewis Abernathy (one of the inspirations for Walter), a fellow Vietnam vet who later became a private investigator and helped him track down and confront a high school kid who stole his car. As in the film, Exline's car was impounded by the Los Angeles Police Department and Abernathy found an 8th grader's homework under the passenger seat. Exline also belonged to an amateur softball league but the Coens changed it to bowling in the movie because "it's a very social sport where you can sit around and drink and smoke while engaging in inane conversation", Ethan said in an interview. The Coens met filmmaker John Milius when they were in Los Angeles making Barton Fink and incorporated his love of guns and the military into the character of Walter. According to Julianne Moore, the character of Maude was based on artist Carolee Schneemann "who worked naked from a swing" and on Yoko Ono. The character of Jesus Quintana was inspired, in part, by a performance the Coens had seen John Turturro give in 1988 at the Public Theater in a play called Mi Puta Vida in which he played a pederast-type character, "so we thought, let's make Turturro a pederast. It'll be something he can really run with", Joel said in an interview. The film's overall structure was influenced by the detective fiction of Raymond Chandler. Ethan said, "We wanted something that would generate a certain narrative feeling – like a modern Raymond Chandler story, and that's why it had to be set in Los Angeles ... We wanted to have a narrative flow, a story that moves like a Chandler book through different parts of town and different social classes." The use of the Stranger's voiceover also came from Chandler as Joel remarked, "He is a little bit of an audience substitute. In the movie adaptation of Chandler it's the main character that speaks off-screen, but we didn't want to reproduce that though it obviously has echoes. It's as if someone was commenting on the plot from an all-seeing point of view. And at the same time rediscovering the old earthiness of a Mark Twain." The Big Lebowski was written around the same time as Barton Fink. When the Coen brothers wanted to make it, John Goodman was filming episodes for theRoseanne television program and Jeff Bridges was making the Walter Hill film, Wild Bill. The Coens decided to make Fargo in the meantime. 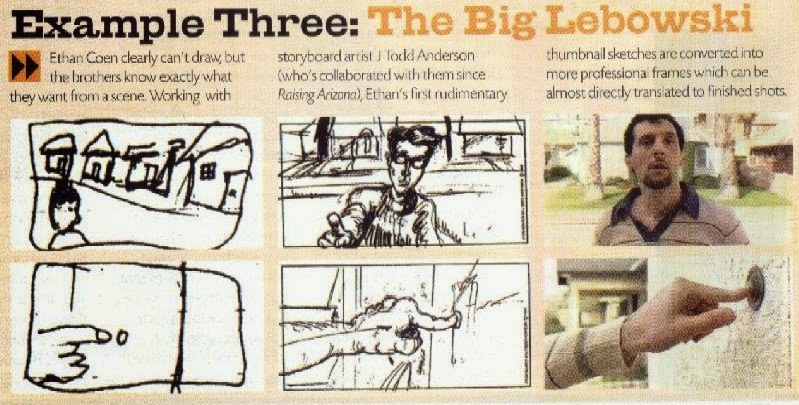 According to Ethan, "the movie was conceived as pivoting around that relationship between the Dude and Walter", which sprang from the scenes between Barton Fink and Charlie Meadows in Barton Fink. They also came up with the idea of setting the film in contemporary L.A. because the people who inspired the story lived in the area. When Pete Exline told them about the homework in a baggie incident, the Coens thought that that was very Raymond Chandler-esque and decided to integrate elements of the author's fiction into their script. Joel Coen cites Robert Altman's contemporary take on Chandler with The Long Goodbye as a primary influence on their film in the sense that The Big Lebowski "is just kind of informed by Chandler around the edges". When they started writing the script, the Coens wrote only 40 pages and then let it sit for a while before finishing it. This is a normal writing process for them, because they often "encounter a problem at a certain stage, we pass to another project, then we come back to the first script. That way we've already accumulated pieces for several future movies." In order to liven up a scene that they thought was too heavy on exposition, they added an "effete art-world hanger-on", known as Knox Harrington, late in the screenwriting process. In the original script, the Dude's car was a Chrysler LeBaron, as Dowd once owned, but that car was not big enough to fit John Goodman so the Coens changed it to a Ford Torino. 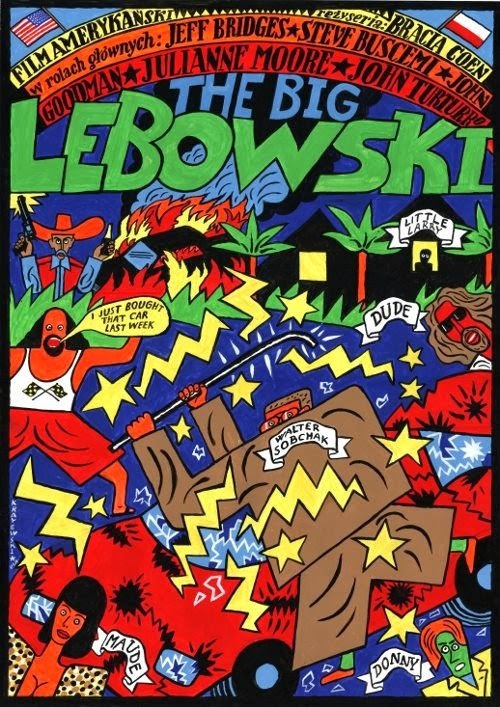 PolyGram and Working Title Films, who had funded Fargo, backed The Big Lebowski with a budget of $15 million. In casting the film, Joel remarked, "we tend to write both for people we know and have worked with, and some parts without knowing who's going to play the role. In The Big Lebowski we did write for John [Goodman] and Steve [Buscemi], but we didn't know who was getting the Jeff Bridges role." In preparation for his role, Bridges met Dowd but actually "drew on myself a lot from back in the Sixties and Seventies. I lived in a little place like that and did drugs, although I think I was a little more creative than the Dude." The actor went into his own closet with the film's wardrobe person and picked out clothes that he had thought the Dude might wear. He wore his character's clothes home because most of them were his own. The actor also adopted the same physicality as Dowd, including the slouching and his ample belly. Originally, Goodman wanted a different kind of beard for Walter but the Coen brothers insisted on the "Gladiator" or what they called the "Chin Strap" and he thought it would go well with his flattop haircut. For the film's look, the Coens wanted to avoid the usual retro 1960s clichés like lava lamps, Day-Glo posters, and Grateful Dead music and, for it to be "consistent with the whole bowling thing, we wanted to keep the movie pretty bright and poppy", Joel said in an interview. 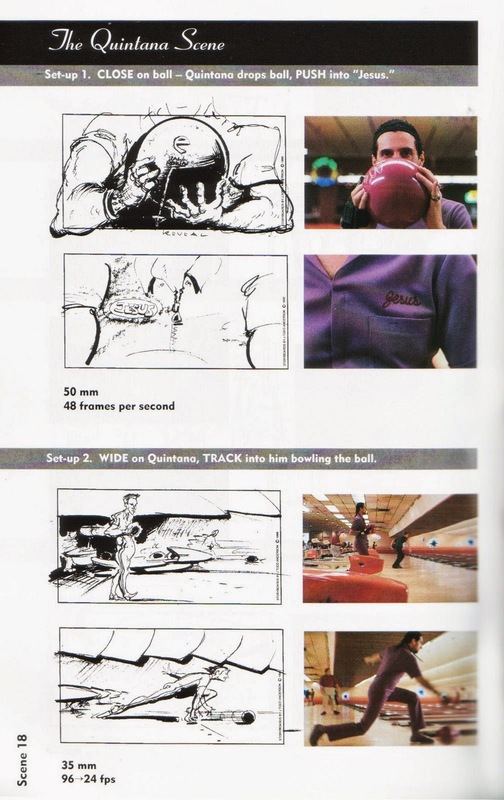 For example, the star motif featured predominantly throughout the movie started with the film's production designer Richard Heinrichs' design for the bowling alley. According to Joel, he "came up with the idea of just laying free-form neon stars on top of it and doing a similar free-form star thing on the interior". This carried over to the film's dream sequences. "Both dream sequences involve star patterns and are about lines radiating to a point. In the first dream sequence, the Dude gets knocked out and you see stars and they all coalesce into the overhead nightscape of L.A. The second dream sequence is an astral environment with a backdrop of stars", remembers Heinrichs. For Jackie Treehorn's Malibu beach house, he was inspired by late 1950s and early 1960s bachelor pad-style furniture. The Coen brothers told Heinrichs that they wanted Treehorn's beach party to be Inca-themed with a "very Hollywood-looking party in which young, oiled-down, fairly aggressive men walk around with appetizers and drinks. So there's a very sacrificial quality to it." 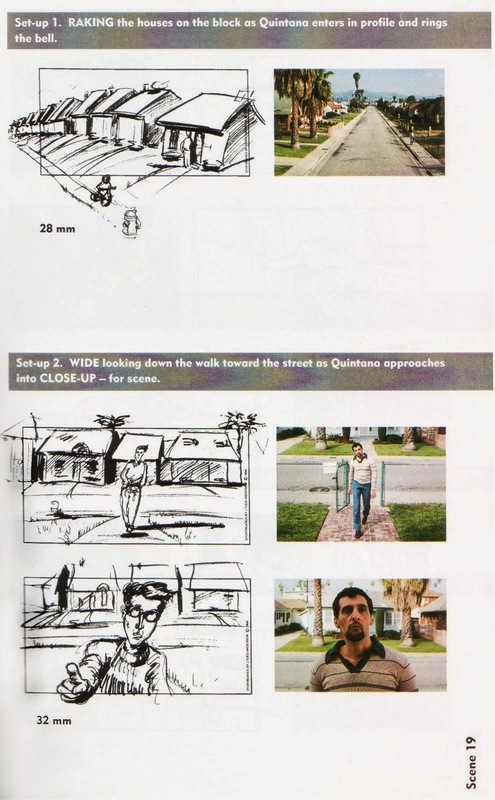 Cinematographer Roger Deakins discussed the look of the film with the Coens during pre-production. They told him that they wanted some parts of the film to have a real and contemporary feeling and other parts, like the dream sequences, to have a very stylized look. Bill and Jacqui Landrum did all of the choreography for the film. For his dance sequence, Jack Kehler went through three three-hour rehearsals. The Coen brothers offered him three to four choices of classical music for him to pick from and he chose Modest Mussorgsky's Pictures at an Exhibition. At each rehearsal, he went through each phase of the piece. Actual filming took place over an eleven-week period with location shooting in and around Los Angeles, including all of the bowling sequences at the Hollywood Star Lanes (for three weeks) and the Dude's Busby Berkeley-esque dream sequences in a converted airplane hangar. According to Joel, the only time they ever directed Bridges "was when he would come over at the beginning of each scene and ask, 'Do you think the Dude burned one on the way over?' I'd reply 'Yes' usually, so Jeff would go over in the corner and start rubbing his eyes to get them bloodshot." Julianne Moore was sent the script while working on The Lost World: Jurassic Park. She worked only two weeks on the film, early and late during the production that went from January to April 1997 while Sam Elliott was only on set for two days and did many takes of his final speech. The scenes in Jackie Treehorn's house were shot in the Sheats Goldstein Residence, designed by John Lautner and built in 1963 in the Hollywood Hills. 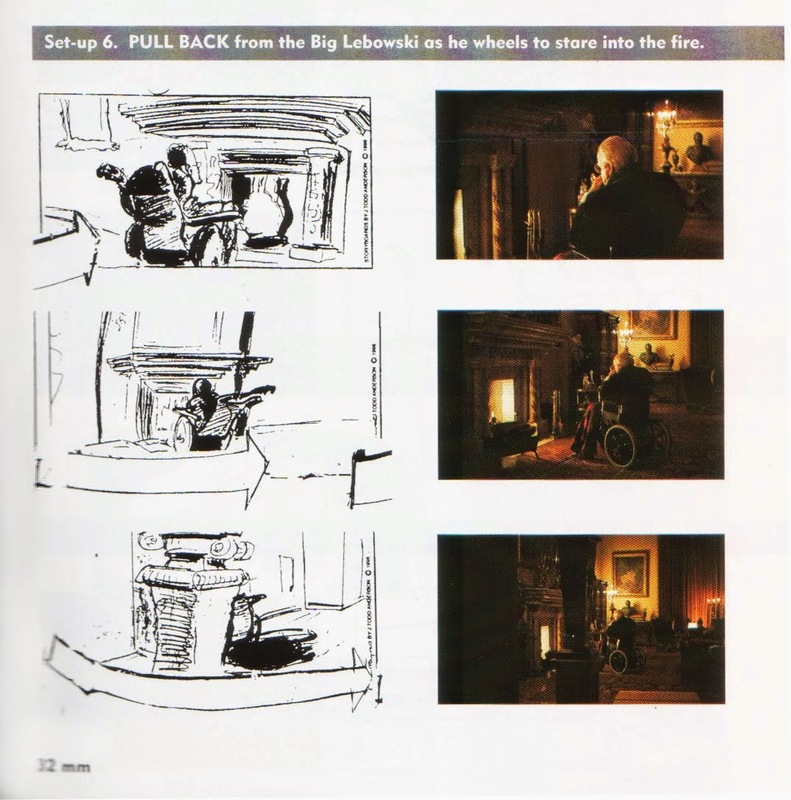 Deakins described the look of the fantasy scenes as being very crisp, monochromatic, and highly lit in order to afford greater depth of focus. However, with the Dude's apartment, Deakins said, "it's kind of seedy and the light's pretty nasty" with a grittier look. The visual bridge between these two different looks was how he photographed the night scenes. Instead of adopting the usual blue moonlight or blue street lamp look, he used an orange sodium-light effect. The Coen brothers shot a lot of the film with wide-angle lens because, according to Joel, it made it easier to hold focus for a greater depth and it made camera movements more dynamic.